Evolve Housing has won 30 industry awards over the last two years, and is a designated Tier 1 Community Housing Provider. Our significant experience in property and tenancy management has earned us a well-deserved reputation for social excellence. We provide innovative housing services and solutions to those in need, and develop partnerships that provide positive social outcomes for individuals and their communities. We are proud of our workforce, and recognise that the quality, responsiveness and professionalism of our staff is directly linked to achieving our strategic goals. We are committed to providing a supportive and rewarding working environment, which includes learning and development opportunities. By investing in professional development for our people we extend and broaden the scope of our professional capabilities; provide opportunities to acquire, practise and adopt new knowledge; and enhance individual, group and organisational learning and capabilities. We currently own or manage more than 4,200 social and affordable properties, housing more than 11,200 people, and invite you to become part of our diverse, inclusive and disability-friendly workplace. We approach opportunities and challenges with creativity and enthusiasm. We encourage those around us to imagine, learn, innovate and to do things better. We are honest, fair and ethical in all interactions. We do the right things for the right reasons all the time. We are aware of and sensitive to the feelings and perspectives of others and use that understanding to guide our actions. We act with professionalism and take responsibility for our decisions and actions. We treat others how we would like to be treated. We value individuality and diversity. 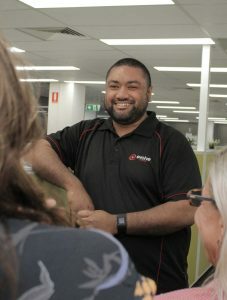 Mat Toailoa joined Evolve in 2013 as a Housing Manager. He manages 170 social and affordable housing tenancies, successfully negotiating the complexities and interconnections between the two types of housing. With the support of the leadership team Mat rose through the ranks, winning PowerHousing Australia’s Rising Star Award in 2017. This award recognises a young up-and-coming team member who demonstrates leadership qualities, enhances tenant outcomes and has developed positive relationships within the workplace. Speaking about the Award, Mat said it was a great privilege and exciting opportunity to be named as the 2017 Rising Star. Danielle Wilcock, Senior Manager, People and Capability, said that Evolve is always looking for training and development opportunities for staff. “We know we need to build our internal capacity and capability to be able to realise our strategic goals, and are proud to invest in quality people, including Mat”, she said. Evolve provides all employees with the option to access Salary Sacrifice arrangements as a way to increase your take home pay. Up to $18,550 of your expenses can be salary packaged, and your mortgage, loans, rent, credit card, health insurance or school fees could all be included. Birthday Leave – enjoy a day off for your birthday every year. Volunteer Leave – take a day every year to give back to the community through volunteering. Purchased Annual Leave – purchase additional leave to help manage work and personal commitments. Annual Shut-down – we have a company-wide shut down over the Christmas/New Year Period. We encourage our staff to continually develop their skills and knowledge and provide training opportunities, including substantial online training on a variety of areas which is relevant to many work places. We understand that by investing in our people, we extend and broaden the professional capacity of both the individual and Evolve Housing. We recognise that we will only achieve our strategic goals by investing in our staff to build internal capacity and capability. Our staff have access to a range of learning and development opportunities including attendance at conferences, participation in working groups/committees, secondments, in-house and external training courses, and access to online learning. Staff are encouraged to explore learning and development opportunities with their manager throughout the year. If you are interested in working with a dynamic, supportive organisation, please submit your expression of interest below and we will respond to you as soon as possible.